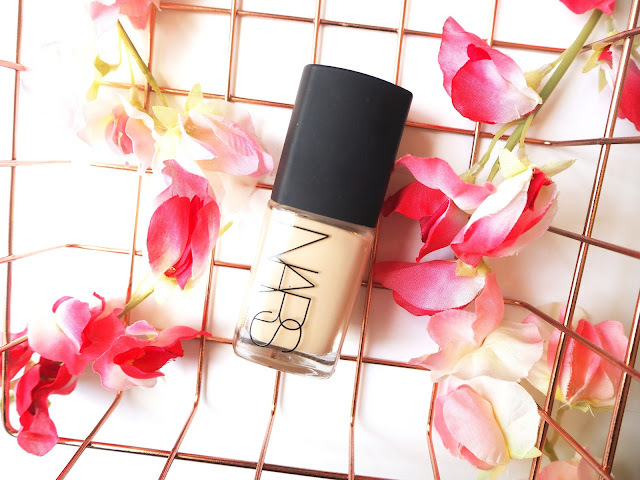 It has come to my realisation recently that even though I have featured Nars Sheer Glow in posts I have never done a complete review on it, I don't know how thats happened but I'm putting it right today! Unfortunately this foundation has been out of my life lately as they didn't have my shade in stock for weeks and weeks anywhere in the UK, very annoying but I have it back now so I have put the trauma behind me. Getting it again after not using it for a few months I was curious to see if it would be as good as I remembered.... and it was! Yay! This one comes in at £32 a bottle so a little on the pricey side and it doesn't come with a pump so you either have to be very careful when you pour it out or you need to buy a pump. Nars sell them for £3 and I always get one so that brings the grand total to £35, definitely getting close to the maximum I would spend on a foundation. However this is a repurchase so clearly in my mind this is money well spent. My favourite way to apply this beauty is with a Beauty Blender as it gives the most flawless, natural looking finish you could want. One layer gives a sheer coverage and for day to day this is enough as I find my skin tone is evened out nicely and it makes me look much more awake than I usually feel! If its a special occasion or I have a bit more time then I like to build up the coverage. Its recommended for normal to dry skin but my skin is combination and I have no issues with it. I find it gives my skin a beautiful glowing, healthy finish but without looking shiny and like I need a tonne of powder. The staying power of this foundation is immense. Admittedly I do have to powder a little throughout the day (though thats common for my skin) but I don't find the foundation breaks down or looks bad at all after a day at work or a night out. Eurgh, I just have so, so, so much love for this foundation. It's a glowy, healthy, radiant dream and I cannot recommend it enough to you lovely lot! I am over the moon to have it back in my life and like it just as much as ever. Do you love Nars Sheer Glow? That's so annoying that the foundation doesn't come with a pump...I feel like every foundation should come with a pump! The foundation itself sounds lovely though, I love build-able foundations!